These pasta bundles are essentially lasagna rolled up on its side, rather than laid flat. They’re fun and easy, for a change of pace. The small amount of goat cheese mixed into the filling offers a welcome tang. Look for fresh ricotta, it’s far superior to the mass-produced version stocked in supermarkets. You’ll find it at Whole Foods, small specialty grocers or high-end markets. If you like, add chopped, fresh mushrooms to the filling too. Cook the mushrooms with the garlic—before adding the spinach—until they begin to brown, about 5 minutes or so. 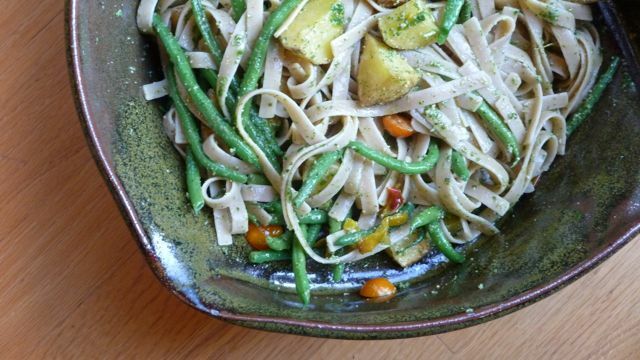 This pasta makes use of our summer bounty of cherry tomatoes. 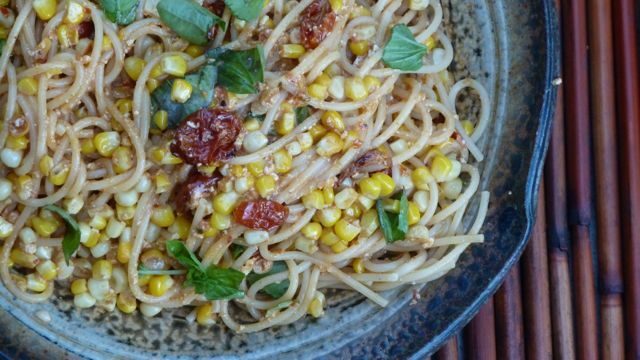 We slow-roast them then add to creamy sun-dried tomato pesto sauce and toss with summer corn, noodles and fresh basil. The sweet corn lends a pleasant and unexpected crunch. The roasted tomatoes—rich, concentrated flavor in each bite. Feel free to substitute frozen corn for the fresh, and uncooked cherry tomatoes (halved) for the slow-roasted ones. A bottled jar each of basil pesto and roasted peppers turns this dish into an easy weeknight meal. But if you feel inclined, it’s always better to make your own. Roasting peppers is as simple as lightly coating seeded bell pepper halves with olive oil and cooking skin-side down at 400 degrees for 30 minutes. If you want, place the roasted peppers into a covered bowl for 10 minutes to steam, then remove the skins. Otherwise, just chop, with the skins on. The combination of ingredients here is easy to love—a bowl full of pure comfort. That just happens to make use of summer’s finest produce. This dish offers a winning flavor combination deepened in the roasting. You’ll find the vegetables are fabulous on their own or tossed with cooked grains like brown rice or farro. Even piled on toasted baguette slices. 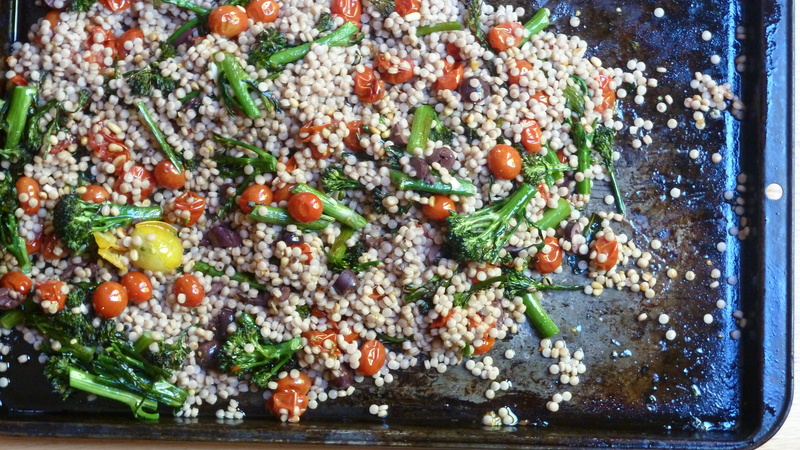 We enjoy the partnership with orzo or Israeli couscous (the whole-wheat version pictured above). The itty-bitty pasta creates a smooth, easy bite that hardly needs chewing. Like hundreds of tiny, soft balls. So adorable, who can resist? This is the perfect summer dish when the garden bed is loaded with cherry tomatoes. This light, spring salad finds inspiration in the flavors of the Middle East. 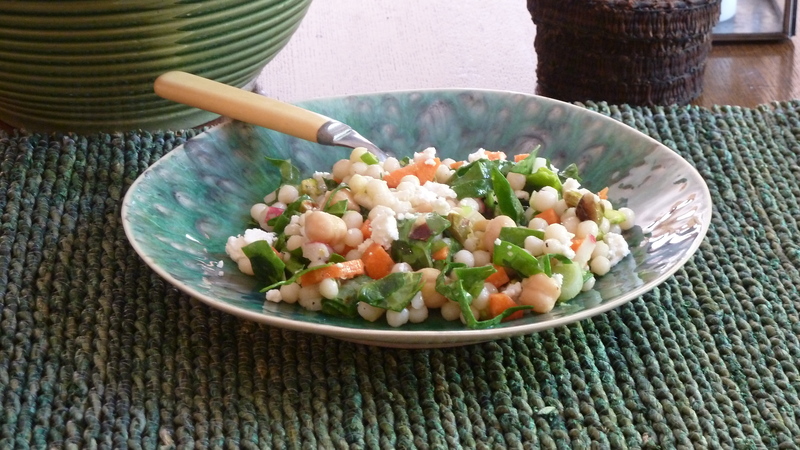 Israeli couscous is a round, pasta-like product — you’ll find it with dried grains and legumes at many grocery stores. Substitute orzo if you are unable to locate. Cook the couscous like you would pasta, in plenty of water until it is past al dente — pleasantly soft when you bite into it, though not mushy. Arugula could sub for spinach here, or a few handfuls of fresh spring herbs. Add some blanched broccoli, crunchy celery or fennel. Try cooked lentils instead of chickpeas. Or leave the legumes out entirely. Zest the lemon before juicing, for easiest handling.